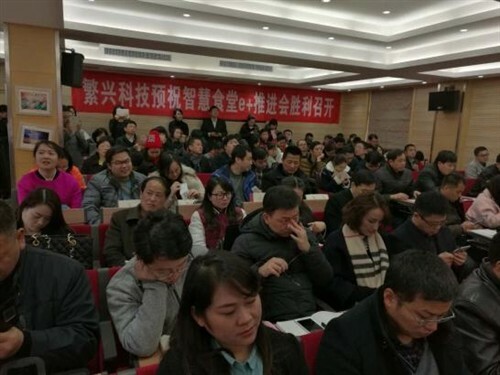 Recently, the commendation conference of upgrading projects for Nanjing primary and secondary schools’ canteens and “e+” Smart School Canteens Boost were held in Nanjing. It was reported that the conference invited leaders and experts from the Education Department of Jiangsu Province, Nanjing Food and Drug Administration and the District Education Bureau, Chinese Center for Disease Control and Prevention(CDC), Centers for Disease Control and Prevention in Nanjing and Jiangsu Province, as well as the Next Generations Working Committee, China Educational Instrument & Equipment Association(CEIEA), China Education Logistics Management Association and other relevant units to attend. The meeting was of great significance in promoting the development of smart canteens in our country, which means school canteens of China officially entered an era of “unmanned cooking”. At the conference, a "special guest" – the practitioner of China’s smart canteens – Pansum’s cooking robot, made a splashy appearance and amazed all attendees.